Keen Terradora Review: Is This The Best Trail Shoe For You? The trail shoe being reviewed is the Keen Terradora leather waterproof Mid, in mushroom/magnet colors. Hiking For Her received this trail footwear free of charge. All of the reviews you read on this website are uncompensated: no money was received to write the review. These trail shoes were worn on a 10+ mile hike on fairly easy terrain, over an 8 hour period on a 65F day. Note: Some would call these hiking boots, rather than shoes, but keeping reading to see where this footwear is most appropriate. 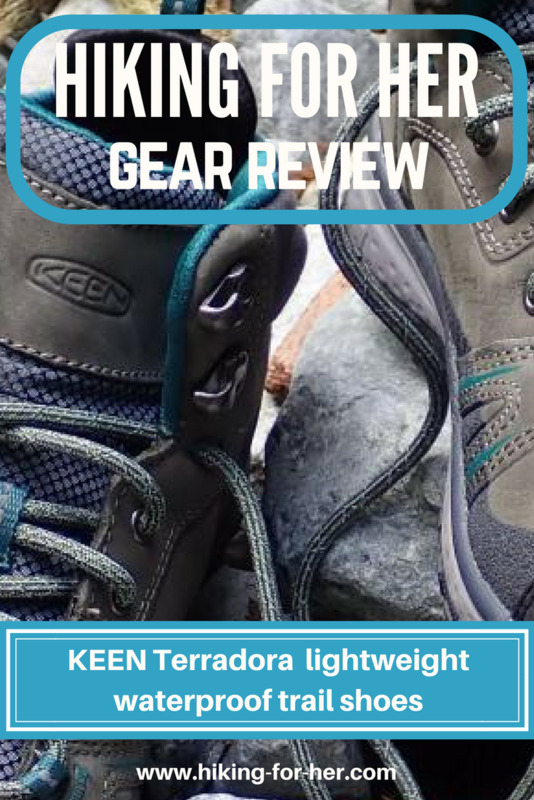 All of the photos, opinions and comments in this Keen Terradora review belong to Hiking For Her. 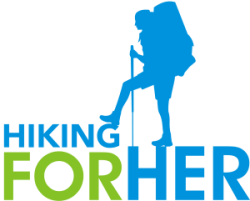 If you purchase a pair of these performance hiking shoes using this link, HFH will receive a small percentage of your purchase price but you pay nothing extra. As a long time user of Keen, Hiking For Her is in a unique position to analyze and comment on this new trail shoe from Keen. Skip this if you're already on board with the way Keen rolls. Available in women's sizes 5 - 11 U.S. This trail shoe is designed to hug your foot closely while giving you flexibility in the ankle area so you can respond quickly and safely to changing trail conditions. Note the cushioned ankle panel, which transfers pressure from your Achilles heel to the shoe. If you're prone to heel issues, these may be the best hiking shoes for you. Keen highlights the woman specific fit, meaning the anatomical differences between male and female hiker's feet were taken into account when designing the Terradora. In fact, this style has a narrower fit than a traditional KEEN woman's shoe, making it a good choice for women with normal to narrow feet. A hiker with a wide foot (like me) would do well to go up at least a half size, while being aware that a snug fit is to be expected. So let's be explicit here. the Terradora is a departure from that focus on wide feet. Be forewarned to avoid disappointment! these are a new style to seriously consider. You can select from 3 color choices, including a yellow and red version which are more bold than the brown pair reviewed here. The Terradora style is also available in a non-leather yet still waterproof version, for a lower price. I was carrying a fairly heavy day pack, loaded up with a big lunch plus second lunch, a full one liter metal water bottle, two cameras, my old pair of Keens (just in case these didn't work out), rain gear, ten essentials, and my phone (turned off). These shoes were able to handle the load on the well packed, mostly level dirt hiking trail I was on, over an 8 hour period of hiking (and snacking). I wouldn't recommend this choice of Keen for a heavier load, or to tackle an extremely rocky or root bound hiking trail. While the arch support was adequate and the padding kept my feet comfortable on this cushy trail, I'm not sure that would be good enough if you were doing a more demanding hike. Keen is known for its out-of-the-box comfort, meaning zero break in time. However, it's up to you to be sure you've got each trail shoe laced properly. While your feet may appear at first glance to be a matched pair, they have individual quirks. Let's use my well used hiking feet as an example. The bones on the outer top area of my right foot near my ankle stick out a lot (note how I kindly spared you a photo). Tight enough so my heel wouldn't slip around. Loose enough to prevent too much pressure on those bones. Yes, this interrupts your trail rhythm and may annoy your hiking partner. Get the right fit, and you'll never have to limp back to the trail head, using your hiking partner for support. If your boots or shoes are bugging you, and you've done a "debris check" to remove errant pine needles or pebbles, try lacing and re-lacing at least a few times. Your feet may have changed a bit. Or the shoes or boots might have gotten wet and dried in a different configuration. Socks get thinner over time. Or maybe it's the phase of the moon! Just don't give up on things right away, without putting more or less pressure on the problem area with an inventive lacing approach. Keen calls these trail shoes, but look at the ankle support and heel cushioning they offer! I'd split the difference and call these particular Terradoras a low cut hiking boot, due to the performance features built into them. If you want traditional low cut trail shoes, meaning nothing around your ankles and as lightweight as possible, take a look at their Terradora waterproof shoes. Do these grip the trail? If you've read other Hiking For Her footwear reviews, you already know I'm obsessed with the soles on the trail shoes or boots that protect my tender soles. Not as much tread as on a hiking boot sole, but not bad! You can see how this trail shoe is built to repel water and to keep trail debris away from your ankles. I'm always up for a challenge, so I decided to wade into the shallows of the river I spent the day paralleling on my day hike. I spent several minutes walking along the river bank of a convenient rocky gravel bar, being sure to avoid going deeper than the tops of the Terradoras. See how I took the risk of wet feet for you in this Keen Terradora review? You're welcome!! Immersion test, just for you! At the end of my experiment, see for yourself how the water had just rolled right off! So I predict that shallow stream crossings and short immersion in standing water won't get your feet wet in these Terradoras. After getting the lacing just right on each foot, and wearing these trail shoes on a long and satisfying hike, I can truly say that you can't go wrong with a pair of Terradoras if you're looking for moderate support, all day comfort, and dry feet. Just don't overlook the narrow fit, and adjust your sizing accordingly. Or play around with the socks you wear. Although I usually hike with two pairs of socks (liners + a thicker heel cushioned pair), I was able to cut that back to just one pair of socks, and had zero hot spots. These trail shoes are nice looking, breathable, lightweight high performance trail wear. They're built for durability and waterproof protection. for support and ankle protection? If your hiking itinerary will take you across deeper water crossings, or into predictably wet and/or rocky terrain, you'll need a different choice on your feet. the Targhee leather EXP Mid. Or check them out right now!